Oh, I’ve also learned what every good webmaster knows: have giveaway, will have hits/comments/linkbacks skyrocket. Which isn’t bad, to say the least. Other things in life, since my Canada Day incident with a cat and subsequently stupid people have been fairly low key and fairly tame. I paid my credit card bill, have thought out what courses I want to take next year (although if the fourth years keep on filling them up, I don’t know what I’m going to be taking next year because I wanted my fourth year to be my ‘easy’ year – if I take 28 credits like I want to for my 3rd year, I only need another 20 credits for my 4th year, whoot). I do have a good chance of getting into two classes that are on my ‘want-to-take’ list – my academic advisor is teaching/lecturing for those and she said that she can force-add me into the class rosters if needed. Oh! I met my paternally approved ‘BFF’ on Saturday. So hilarious. She wants to go to the same school as I do, but my dad lied when he said that she was starting this year, she’s actually finishing up her secondary education still and has one more year to go. She wants to go into pharmacy, not nursing. I don’t know a thing about the requirements for fulfilling first year pre-pharmacy, or what pharmacy even looks at. She wants to go into the Faculty of Science for her first year, but doesn’t like math, chemistry, physics or biology. I just said ‘good luck’ to her, as if pharmacy requires general first year science, she’ll need to take all four, at least 2 classes each, plus 2 classes of English. Anyways, I’m really not sure why my dad thought it’d be a great idea for us to meet/talk/whatever when she doesn’t even want to go into the same program as me. I can’t even give her any advice for application or admissions requirements because they’ve changed everything since I entered my school. Besides the fact that I’m domestic student… and went through the Canadian public school system… Sigh. In other news… Finally finished up a new crochet pattern (just editing my writing – fixing typos, grammatical errors, etc.) and then going to get that up on chelle-chelle.com. Not feeling the greatest today for just a mountain worth of reasons. Starting with my voice, or lack thereof. Off to go and crawl back into bed soon. Or maybe I’ll just have some marshmallows. … sugar’s my catchall cure for everything. Wow you’ve been busy! 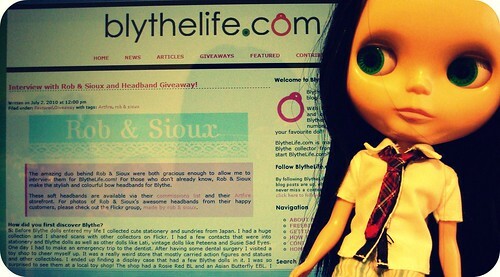 Your blythe website looks great! I hope it goes really well for you! That is silly about the friend your dad wanted you to meet. Sorry it turned out that she didn’t really have much in common school wise with you. I guess your dads didn’t understand or something, haha. In Australia everything changed in university admission after my first year; they had different rules for secondary school students to enter, and had a lot of new courses which I wished they had introduced earlier.